Amphorae Hand Made Ceramic Wine Jars the ancient Greek or Roman two handle, narrow neck ceramic jar used for storing wine or oil etc in, as with the Dipylon Amphora. Here are some interesting facts about Dipylon Amphora, c. 755-750 B.C.E. 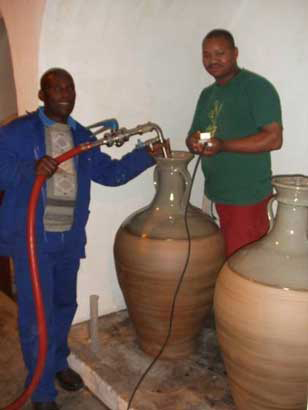 These pictures show some of the process that we used for making large Amphorae for Hamilton Russell Vineyards in the Hemel-en-Aarde Valley near Hermanus in the Western Cape. 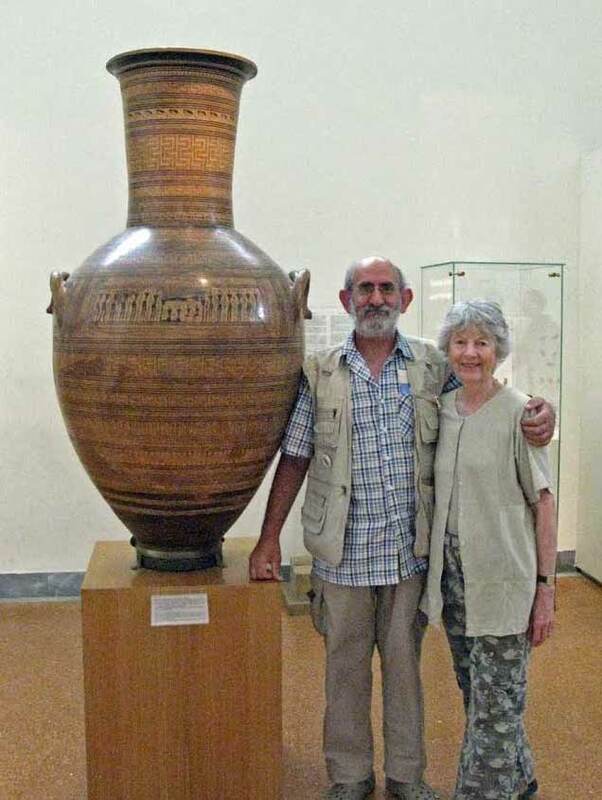 The commission required that we make four large Amphorae, or Wine Jars for Ashbourne, also owned by the Hamilton Russell’s, so that they could try experimenting with maturing wine in clay pots, as might have been done in ancient times. 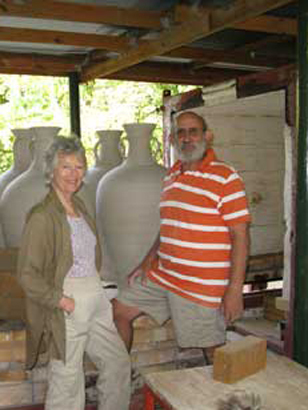 The process began with a great deal of discussion which led to various clay and firing tests to determine a suitable clay to use, then to the sample pots before beginning work on the actual making of the large pots. 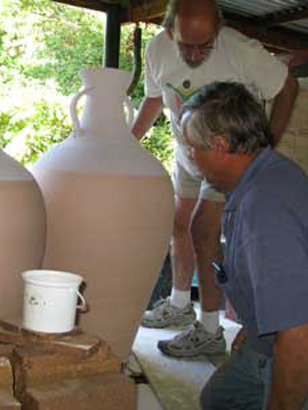 These large jars are hand-made and David threw them on the potter’s wheel in stages using a gas blowtorch to stiffen the stages as he went, taking up to two days on the wheel to complete each jar. 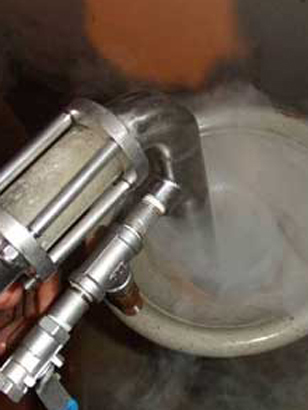 The drying process on work of this size is critical and needed to be carried out very slowly and evenly to prevent cracking and warping or distorting. Once the jars were off the wheel and loaded onto a trolley, they were covered with large plastic bags for 3 to 4 weeks in order to control the speed of dying. After a month inside the studio the jars were wheeled out on their trolleys under the lean-to behind the studio, the bags were removed and the jars were allowed to dry naturally under cover and in the shade for another 4 weeks before loading the kiln for the first firing. 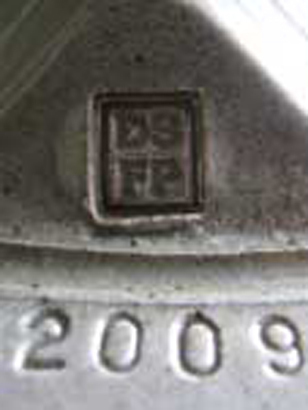 Two of the four wine jars were coated with a slip made of clay dug on the farm where the grapes for the wine were grown. For the first firing, called the bisque firing, the pots were fired to 1 000°C over a period of about 10 hours in a more or less neutral atmosphere, with a very, very slow preheat period before the firing of at least 4 days. The jars were spayed with a light coating of a khaki green glaze on the outside from the shoulder to the top including the handles. 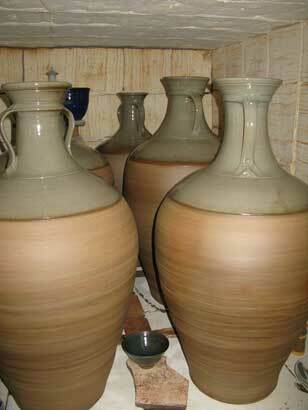 The body of the jars and the insides were left unglazed in order to encourage interaction between the fired clay and the wine as it matures in the jars. 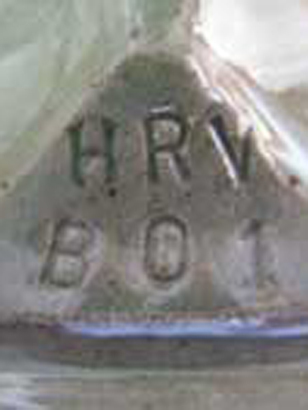 The glaze firing in our oil-fired (paraffin) kiln reached a top temperature 1 320°, Orton Cone 12, in about 10 hours with reduction taking place for about 31/2 hours. 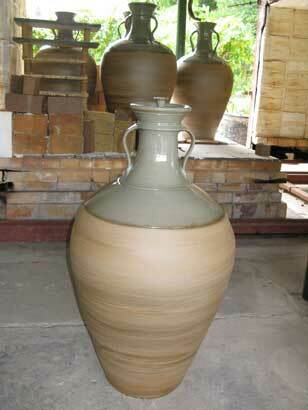 The pots weighed about 80 kg when wet and hold an average of 150 litres of wine each. 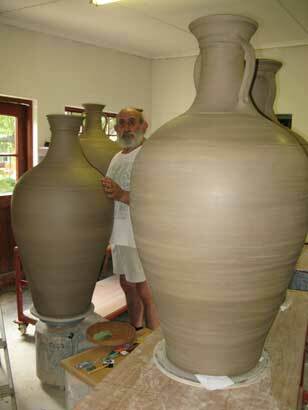 In their unfired state they stood about 1 200mm tall and because of their size and weight, David could not possibly move them on his own and we are most grateful our friend Myburgh de Wet who attends David’s Wednesday evening pottery class who is always willing to lend a hand when needed. An extraordinary amount of work! 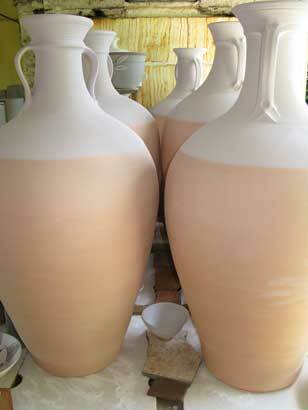 The wine matured in these Amphorae has been bottled as ‘Ashbourne Sandstone 2009’ by Hamilton Russell Vineyards. 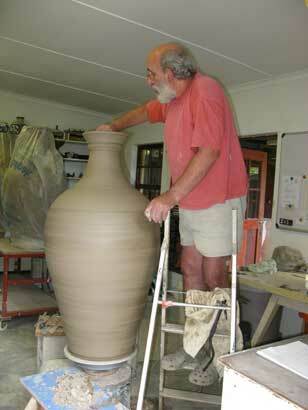 Thank you for spending time on our Amphorea Hand Made Ceramic Wine Jars pages.